FDM vs SLS 3D Printers: Which Tensile Properties? As was mentioned in “Material Considerations for Additive Manufacturing of Polymers: Part 1”, the material properties of a part manufactured via AM do not necessary reflect the material data sheet that the manufacturers release. Luckily for designers and engineers, researchers have been working to identify trends in the properties of parts printed by the different systems. Part 2 looks specifically at tensile properties of materials processed by a Fused Deposition Modeling (FDM) printer and a Selective Laser Sintering (SLS) printer. When conducting tensile strength tests, the test specimens are manufactured according to ASTM standard geometry and fixed by their ends to a tensile testing testing rig. The test rig pulls the specimens lengthwise, increasing the load while measuring the strain (deformation) of the part until fracture. The three images below demonstrate the three directions that the test specimens were oriented for printing. The build direction arrow indicates the direction in which layers of build material were stacked during the build process. For reference, the “Y-direction” specimen has the fewest layers, where the “Z-direction” specimen has the most layers. Print orientation has considerable impact on the strength of the part. This is especially important when designing for a particular tensile load. The chart below shows the tensile data for the Stratasys Fortus 400mc system printing with Ultem 9085. The data demonstrates that tensile strength is significantly greater for test specimens oriented in the “X-Direction” (blue dots) for printing than test specimens oriented in the “Z-Direction” (green dots) at all recorded temperatures. This is an inherent issue in FDM parts due to the manufacturing process. 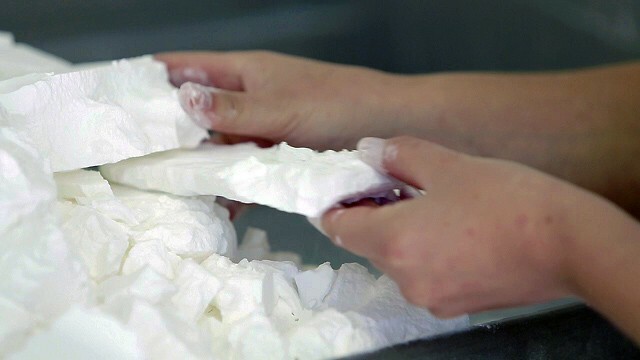 Recall from “Material Considerations for Additive Manufacturing of Polymers: Part 1,” FDM builds parts by extruding melted plastic to build layers. When pulling a tensile test specimen in the same direction that the cross-sectional layers were stacked (the build direction), the samples exhibit low strength. However, if pulled along the path of the tool head deposition (X or Y directions), the material exhibits strength much greater before fracture (blue dots). This can be understood by looking at the break behavior of the specimens, shown in the images below. The left image shows the break behavior for specimens built in the Z-direction, where separation occurs at the interface between two stacked layers. The right image shows that pulling an FDM part along the FDM head path (X and Y directions) requires fracture of many individual extruded plastic fibers. As a result, FDM printed parts exhibit anisotropic mechanical properties. In other words, the mechanical properties of an FDM part are directionally dependent! This anisotropic phenomenon is much less pronounced, yet still existent, in parts fabricated with the SLS process. 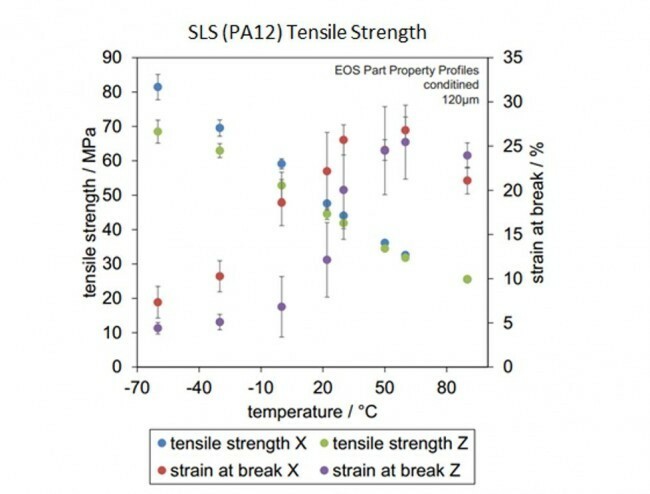 The following chart shows the tensile strength of PA12 SLS parts printed with the EOSINT P395 in the X and Z directions. As SLS sinters polymer particles together rather than depositing plastic filament, there is much less directional dependency on material properties. The above chart shows that both the tensile strength and strain at break in the X-direction (blue and red dots, respectively) is only slightly greater than (if not equal to) the Z-direction (green and purple dots, respectively) of the SLS PA12 parts at all temperatures. The largest difference in tensile strength between the two orientations was 10MPa, occurring at -60°C. 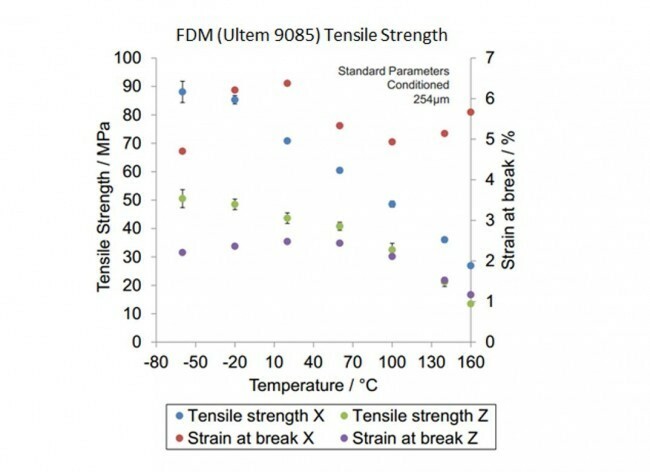 Comparatively, the FDM parts tested at -60°C show a difference in tensile strength 30MPa greater than SLS. This means that the mechanical properties of SLS parts are much more isotropic (up to 3 times more at low temperatures!) than the Ultem 9085 FDM parts. There are two key points to highlight from this data. Looking at both Ultem 9085 and PA12, the charts show that at any given temperature, the tensile strength of Ultem 9085 printed in the X-direction is greater than the PA 12 SLS parts regardless of print orientation. In terms of design, for a part that requires high tensile strength in one direction, you can design a better part for that application with Ultem 9085. However, if you need a part that has tensile strength uniform in all directions (greater isotropy), SLS is the better choice. In the third installment of “Material Considerations for Additive Manufacturing of Polymers,” the material properties of AM parts are compared to injection molded parts. The series concluded in Part 3 with some important considerations for the AM design process when working with polymers. Check it out! This post, based on the work of M. Sc. Matthias Fischer and M. Sc. Stefan Josupeit from the Direct Manufacturing Research Center, has been summarized by Phil Lambert, who recently joined Scultpteo’s blog writting team. Phil is a 3D Printing (3DP) and Design for Additive Manufacturing (DfAM) expert with a background in mechanical engineering. 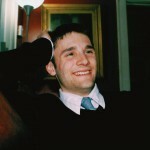 Hailing from the DREAMS Lab at Virginia Tech, Phil has over three years of additive manufacturing experience in designing and building 3D printers as well as using them to make what he considers to be some really, really cool stuff. He plans to bring a mechanical engineer’s perspective to the Sculpteo blog by providing insight into the unique constraints and abilities of 3D Printing with an eye towards mechanical, material, and process considerations. Check out Stratasys FDM thermoplastics here. Visit the EOS materials database to learn about other SLS powders.